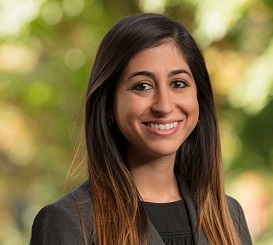 Parisa is the daughter of two healthcare providers, making her keenly aware of the challenges providers face in a continuously evolving profession. She understands the wide-reaching impact a lawsuit has on not just the provider but his or her family, associates, employees and patients. Parisa is passionate about defending providers and allowing them to continue to provide care to their patients. Prior to joining Hancock Daniel, Parisa was a clerk for the Honorable Lenore R. Gelfman, Administrative Judge, Circuit Court for Howard County, Maryland. While working on her degree, she completed a legal internship with The United States Attorney’s Office, Eastern District of Virginia and worked as a Research Assistant for the United States Institute of Peace. She currently serves on the Board of Directors for the Highland Support Project, a 501(c)3 non-profit organization.